Crofts Estate Agents are pleased to market this 2/3 semi detached bungalow located in the popular area of Waltham. The property is provides good of road parking and has a nice sized front and rear garden. 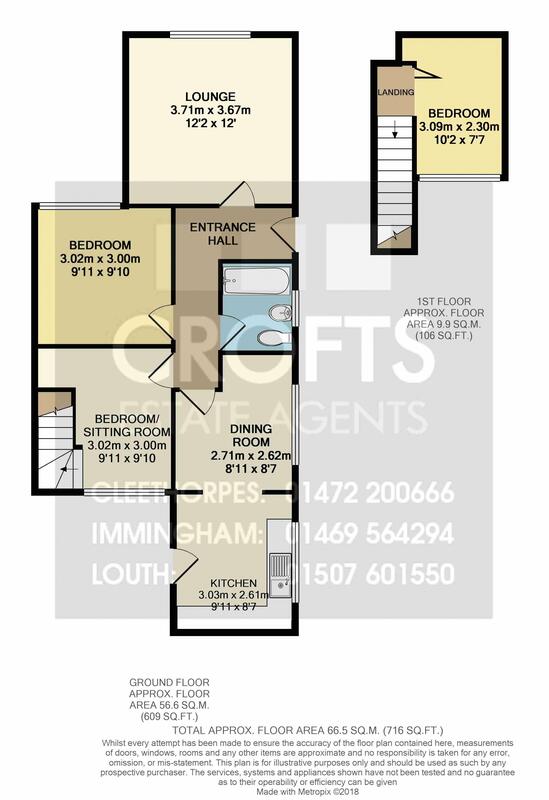 The ground floor layout comprises of entrance hallway, front lounge, double bedroom, family bathroom, dining room, kitchen and finally a rear bedroom, which has the stairs to the dormer bedroom through it. The first floor dormer has a small landing area and a rear bedroom which looks out onto the back garden. The property is being offered with NO FORWARD CHAIN, making this a fast easy sale. Viewings are available immediately. The front garden offers a good level of off road parking which continues down the side of the house. There is a small lawn to the front of the garden and some small bushes which give the property curb appeal. The lounge is located to the front of the bungalow and faces out onto the front garden. A really nice size which has a front uPVC window and a gas central heated radiator. Neutrally decorated throughout as you can see from the photos. The family bathroom is located off the main entrance hallway and is a fairly modern room with offers a three piece suite consisting of a bath with shower over the top, wash basin and toilet. The kitchen diner is two separate rooms which has an arch in the middle creating one large open plan room. In the dining section there is a side uPVC window and a carpeted floor throughout. The kitchen in the property is set over two walls and provides a range of wall and base units. There is a side uPVC window and a door which gives access onto the back garden. The main bedroom in the property is located to the front of the bungalow and is a double size and benefits from a front uPVC window and a gas central heated radiator. The second of the bedrooms faces out onto the rear garden and is a double in size. The staircase leading to the dormer bungalow are located in this room so this could be another reception room. The third bedroom is located upstairs in the dormer section of the bungalow. There is a large rear uPVC window which faces out onto the back garden making this a bright and airy double bedroom. Along the back of the property there is a block paved patio area which runs up to the lawn which takes up the rest of the garden. There is a fence which runs around the border keeping this garden area nice and private.